HIGH FIVE WITH YOUR RABBIT: caring, training, playing. 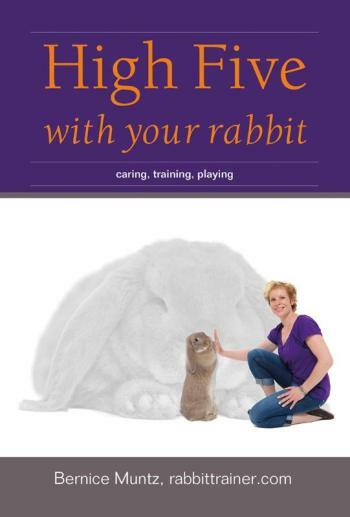 The E-pub High Five with your rabbit is a unique book for anyone who has a rabbit. More often than not, rabbits are confined to a small space and have a relatively boring existence. This does not have to be the case! In High Five with your rabbit you learn about the kind of care your rabbit needs and how both you and your rabbit can have a more rewarding experience together. Read about: Developing ties with you rabbit Enjoying and playing with your rabbit How you can teach your rabbit football How you can teach the 'rabbit dance' How you can teach your rabbit agility Rabbit language and what they are trying to communicate to you Feeding, health and edible plants How to toilet train your rabbit How to deal with destructive gnawing How to avoid and manage aggressive behaviour And so much more .... About rabbit trainer Bernice Muntz Bernice Muntz is a famous and renowned animal trainer in Europe. She is regularly called upon to advise international veterinarians as well as the staff of animal asylums (shelters). She has done workshops and lectures in Europe, as well as overseas, to the general public as well as veterinarian students. She has appeared on a large number of television programmes, sharing her tips for training animals and demonstrating all they are capable of. Following her studies to become a Behavioural Counsellor for dogs she continued her professional development at the IDTS (International Dog Trainers School) in England and set up and run her own dog training school. She is a certified SATS Trainer and works with a wide range of animals, such as badgers, sheep, birds, cats, dogs, rabbits and guinea pigs, to name a few. For Bernice, training animals is about strengthening the bond between the animal and its care-giver/owner. As the owner learns to understand their animals better, the animals themselves are physically as well as mentally stimulated. The improved communication between them results in a bond. Furthermore, according to Bernice, it is also important that the animals learn behaviours which will enrich their lives. A potty trained rabbit can roam around the house or garden enclosure, have more freedom. High Five with your rabbit is for children, adults and veterinarians.